Motley (red) goes head to head with Chesapeake (blue) in BFHA Fall League play. The Baltimore Field Hockey Association's fall league is our busiest and most structured season of the year, but that only adds to the fun! As with all of our seasons, all experience levels are invited and encouraged to participate. Fall Clubs is organized much like the other seasons, in that you play once a week. 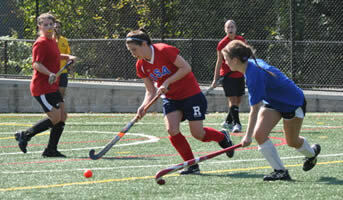 Club play is held every Saturday or Sunday on the turf fields. The unique characteristic of the fall season is that the five teams keep the same rosters year after year. Therefore, each year new players are assigned by the Club Chairperson to one of the five teams, and will play with that same team every fall. Every time we play, each team plays the other four club teams, and at the end of the season a club championship tournament is held with rankings determined by each team's win-loss record throughout the season. The Fall season is typically plated at Roland Park Country School. Season runs from around August 26 - November 4 (usually Sundays). BFHA also hosts a fall play day typically in September or October. Final day of Fall season is the Annual General Meeting (AGM) and playoffs / championship game. Congratulations to the 2018 Fall champs, Chesapeake (blue)! See you in 2019!